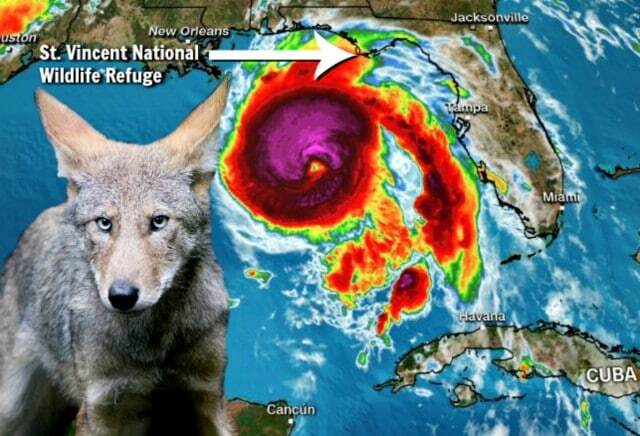 Communities along the Florida panhandle are bracing for the onslaught of Hurricane Michael, but what about the wildlife? Critically endangered red wolf M1804, aka Thicket, was born at the Wolf Conservation Center in 2010 and released in the wild in 2013 on St. Vincent National Wildlife Refuge – a remote barrier island just offshore the Florida panhandle. Saint Vincent Island compacts a diversity of habitats into 12,000 acres, making it an ideal red wolf island propagation site. But when in the path of Hurricane Michael – a storm threatening to become the strongest hurricane on record to strike the Florida Panhandle – this island is far from ideal. In this video, supporters of the refuge recount the devastation caused to the barrier island by Hurricane Dennis in 2005. The red wolves proved resilient 13 years ago, surviving the tsunami-like surge by seeking higher ground. We hope Thicket and his family prove their resilience in the face of this new threat. Please join us in sending positive thoughts to all the people, pets, and wildlife in the path of this storm.